Here's What You Need To Know About Hurricane Irma : The Two-Way As the powerful storm approaches the U.S., here are some of the basics about the dangers it poses. The most powerful Atlantic Ocean hurricane in National Hurricane Center records has roared into the Caribbean and was on a path to hit Florida this weekend or early next week. As of Thursday morning, Irma was still a Category 5 storm. 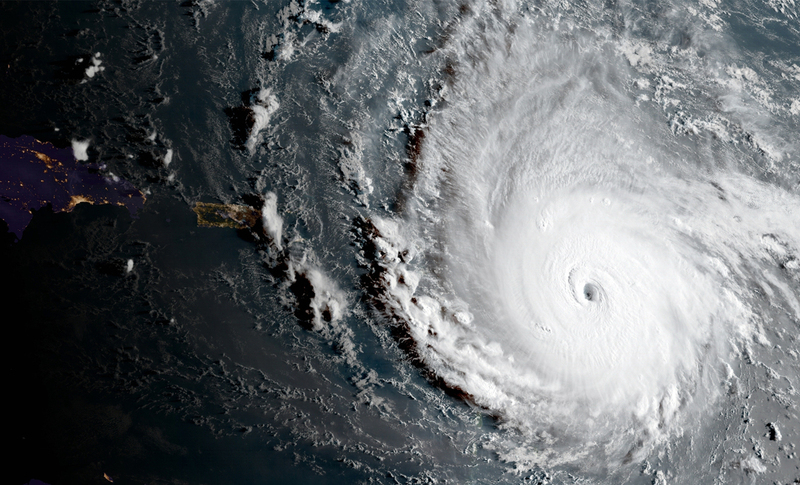 Irma is one of the most powerful Atlantic Ocean hurricanes ever recorded, and its wind speeds remain about 150 miles per hour, with stronger gusts. As this monster churns through the Caribbean and heads toward Florida, here is the lowdown. How does Irma compare with Harvey? Harvey caused trouble by basically parking in one place and dropping mind-boggling, historic amounts of rain. Irma, by contrast, is a whirling dervish that has been sweeping through the Caribbean islands and leaving devastation in its wake. Unlike Harvey, Irma's damage should come primarily from storm surge and the violent winds. What could Irma do to Florida? The National Hurricane Center says that "the eye of Irma should move near the north coast of Cuba and the central Bahamas today and Saturday, and be near the Florida Keys and the southern Florida Peninsula Sunday morning." A Hurricane Watch is in now in effect for much of Cuba, and also southern Florida including the Florida Keys, Jupiter Inlet southward around the Florida peninsula to Bonita Beach, Lake Okeechobee and Florida Bay. The watch will likely extend northward later on. And Florida officials have already announced mandatory evacuation orders for certain areas such as the Florida Keys and low-lying parts of Miami-Dade County. Schools have closed, shelters are being set up, and the governor says all 7,000 members of the National Guard will be deployed as of Friday. Is it unusual to have two strong storms back to back? Harvey was the most powerful storm to hit the mainland U.S. in over a decade, and now Irma is hot on its heels. But this isn't the first time two impressive storms have hit in rapid succession. In 1954, Carol and Edna menaced the East Coast within two weeks of each other and were soon followed by Hazel. In 1955, Connie and Diane "struck the North Carolina coast only five days apart," according to the National Hurricane Center. But hurricanes draw their strength from the warmth of water below, and climate scientists point out that global climate change is increasing ocean temperatures, likely producing more powerful storms.